di Bocconi Students Investment Club 9 Novembre 2017 8 min. On November 1, 2017, CK Asset Holdings announced an agreement to sell the skyscraper located in Central (Hong Kong) known as “The Center” to C.H.M.T. Peaceful Development Asia Property for a total transaction value of HK$40,2bn ($5.15bn). The sale of The Center, a 73-storey building in Hong Kong’s bustling Central district, is tracked by numerous analysts as the world’s biggest ever single property sale. Although Hong Kong housing prices are close to their peak and economically “unsustainable”, Chinese firms have been aggressively expanding in Hong Kong property along with many internationally-projected investors. Indeed, the deal comes after Mainland developer LVGEM (China) Real Estate Investment’s statement in mid-October, which said that it would buy an office tower for HK$9bn to strengthen its presence in Hong Kong property. About CK Asset Holdings Ltd.
CK Asset Holdings Limited – formerly known as Cheung Kong Property Holdings Limited – is a leading and influential real estate investment company owned by Li Ka-Shing, Hong Kong’s wealthiest businessman. The company – which operates mainly as a property developer in Hong Kong, the Mainland China, Singapore, and the UK – is headquartered and listed in Hong Kong. Its activities include residential, commercial, and industrial property development and investment; hotel and serviced suite operation; and property and project management services. It also provides property agency services, financing services, and aircraft leasing services through its subsidiaries. As of FY2016, CK Asset Holdings Limited reported revenues for HK$69.9bn, which represents a 19% increase compared to the FY2015 figure. By breaking down the revenues, almost 92% of them come from the sales and rentals of properties both in Hong Kong and internationally, while operations from its minor businesses generate just HK$5.7bn of the total amount of revenues. Overall, net income stood at HK$19.42bn, up 13% over the 1-year period. Finally, the company ranks among the top three based on property development revenue and has a market share of around 10% in the region’s commercial real estate market. Its total assets exceed $23bn. About C.H.M.T. Peaceful Development Asia Property Ltd.
C.H.M.T. Peaceful Development Asia Property Ltd is a “special purpose vehicle” incorporated in the British Virgin Islands set up specifically to undertake the acquisition. The consortium’s largest shareholder is Beijing-based China Energy Reserve & Chemicals Group, with a 55% stake. The 45% left is held by a group of Hong Kong businessmen, the SCMP said. China Energy Reserve & Chemicals Group – the aforementioned biggest shareholder – is an energy trader backed by state oil major China National Petroleum Corp, which in turn is a PetroChina subsidiary. Hong Kong was recently ranked the most expensive housing market in the world for the seventh consecutive year, according to the annual Demographia International Housing Affordability Survey. The survey, which divides median house prices by gross annual median household income, found Hong Kong to clock in at 18.1x. In its own right, such multiple is extremely high and well above comparable markets across the globe. To have an idea of the magnitude, the second least affordable city was estimated to be Sydney which scored a considerably lower multiple of 12.1x, and to a further extent, even financial hubs the likes of London and New York pale in comparison, coming in at multiples of 8.5x and 5.9x respectively. The reasons which underlie such impressive figures are various and diverse. Firstly, Hong Kong’s real-estate astronomical prices are implied by the market, which exhibits an exorbitant amount of demand faced with an extremely limited degree of supply. Hong Kong is one of the most densely populated placed in the world, with a total population of more than 7.3m people and 6,777 people per square kilometer. Further, there is high demand to live and work in one of the world’s financial hubs and the de-facto access point into the world’s most populous country, China. Additionally, there is also very little developable land left in Hong Kong, as liveable land is squeezed between bodies of water and soaring mountains. Residential land use only accounts for about 7% of Hong Kong’s total land, while country parks cover more than 40%. Additional reasons mostly concern governmental policies and restrictions. In principle, all land in HK belongs to the government, but plots of usable land are sold to urban developers each year through a behind-the-scenes tender process. Such developers are usually granted leases for a term of fifty years each to build private flats, hotels, and offices. For years, the government has followed a policy of always selling to the highest bidder, which is held in place to ensure that the process is always fair, while also guaranteeing that the State earns enough money and upholds the philosophy of a free market. From a policy standpoint, such approach has come under ever increasing scrutiny over the years, following concerns of transparency and suggesting for the public administration to opt for a more streamlined public auctioning process. In reality, it may very well be the case that HK’s lax tax policies go hand in hand with the skyrocketing housing market. It is no secret that Hong Kong is one of the most tax-friendly economies in the world, and one of the reasons the government can keep taxes so low is because a large chunk of its revenues come from land sales. If property values drop, the government cannot generate as much revenue, meaning there is little incentive to seriously curb Hong Kong’s cost of housing. In fact, if property values dropped too much, it may very well be the case that the government would even have to rethink its tax revenue system. As one might imagine, government income from these sales of land are quite conspicuous, and last year alone a surplus of HK$92.8bn was generated from these sales alone. 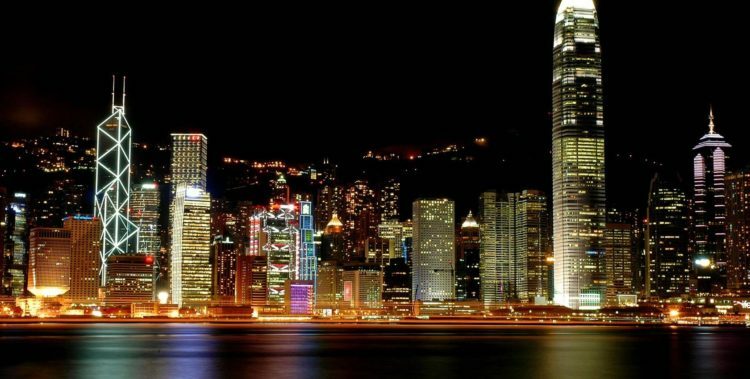 Recently, however, property in Hong Kong has been snatched up by rich mainland Chinese developers, which currently win an average of one out of every three land sales. Today, these aforementioned urban developers are buying land at record-breaking prices, and these purchases are affecting the wider HK real estate market as a whole by inflating overall prices. On a final note, an additional factor constricting supply is determined by other government policies held in place to provide assisted housing plans. In fact, the government controls nearly half of the total supply or housing through public housing rentals and assisted homeownership purchase programs, which are intended for lower-income families. In reality, this implies that just about half of the overall housing market is effectively available for sale on the private market, further limiting supply. As announced, CK Asset Holding’s subsidiary – The Center International Limited – agreed to sell at a price of HK$40.2bn ($5.15bn) subject to the Current Asset/Liability Adjustment its skyscraper property in Central (HK) to C.H.M.T. Peaceful Development Asia Property Limited, a special purpose vehicle set up by a group of investors not fully disclosed. The price set comes out after arm’s length negotiations between the vendor and the representatives of the purchaser, having taken into account various factors, including, among others, recent market transactions and the prevailing market conditions in Hong Kong. The payment has been arranged in two tranches: the deposit and the extension payment. On the one hand, the deposit needs to be paid in cash directly to CK Asset Holdings Ltd as soon as the sale and purchase agreement will be fully executed. On the other hand, the extension payment has to be set taking into consideration the purchaser’s option to postpone the completion to a new date paying an interest calculated at the rate of 2.5% per annum on the amount of HK$20 billion. CK Asset said in a filing that it expects to record a gain of about HK$14.5bn from the sale, with the proceeds to be used for general working capital purposes. “Hong Kong housing prices are close to their peak and economically unsustainable”, said Cusson Leung, managing director at J.P. Morgan Chase & Co.’s Asia Pacific equity research unit. “No one can tell how deep the adjustment will be or what is the appropriate level of adjustment”, claimed Paul Chan, who was appointed as Hong Kong’s Financial Secretary in January, concerned about a correction in the world’s priciest housing market. It is in this climate of concerns and warnings that CK Asset has tried to take advantage of an explosive demand for office real estate by mainland Chinese companies in Hong Kong. Thus, Li Ka-Shing has been seeking to sell the building for at least a year, as he sought to trim his Hong Kong assets. Estimated at more than HK$35bn by value, The Center attracted the attention of a handful of deep-pocketed Chinese buyers. Then, the decline in the Chinese yuan against the US dollar has made it more attractive for mainland firms to seek better returns by parking their capital in real estate and several such buyers had expressed a strong interest in acquiring the CK Asset office tower. On the other hand, the deal shows that Hong Kong’s commercial property market is still competitive, and is unlikely to be affected by high prices. Its status as a gateway to the world’s second-biggest economy, with Western-style legal protections, means that Hong Kong will continue to attract investment at least as long as the former British colony’s role as a conduit for capital into and out of China remains untouched. CK Asset’s share price jumped as much as 3.2% on October 16, the biggest rise in a month, when the Hong Kong Economic Journal reported that the building had been sold, without identifying the buyer. The stock rose 0.9% on Wednesday November 1, to HK$64.70.